The LA Times recently ran a story with plenty of photos about a house built in a cave. The Sleepers — Curtis, Deborah and their children, Kian, Perry and baby Theodore Wesley — live in a cave, a 17,000-square-foot gouge in the earth left by a 1930s sandstone mine. 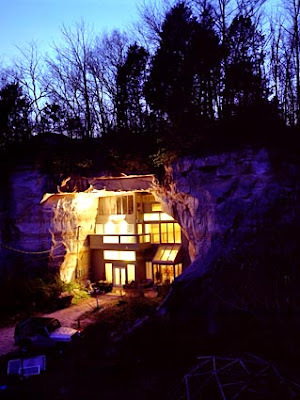 It’s Tom Sawyer country here in Festus, Mo., just a few miles from the Mississippi River, and the Sleepers showed their adventurous side by making their home 45 feet under a forest (and a neighbor’s home).